Are you like me? 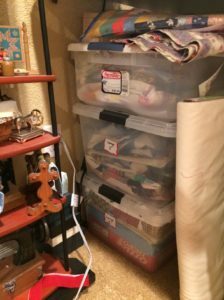 Do you have a number of projects sitting in piles in your quilting studio? It’s time to get organized! New Year means new plans. I want to share some tips with you of ways to organize your WIP – Work in Progress. WIPs can be defined as a quilt that only needs the binding, or it is a top that needs quilting and binding, or it is a few blocks with a lot of fabric and a pattern, or it is just some of your fabrics that seem to go together. I think it is important to keep them together in projects, so I use tubs. I have a bad habit of being distracted with a new idea or project and the old one sits in one of the various stages and next thing I know it has been there for months or even years (I hope I’m not the only one like this). 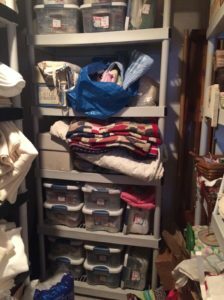 Several years ago (ok, it was over 10 years ago because I lived in a different house) I decided to organize in small, medium and large tubs. 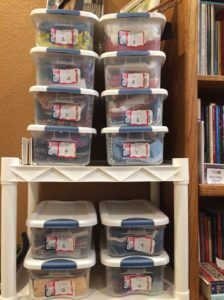 Each tub could hold at least one project, but it kept me from “borrowing” the fabric from one project to complete another and then go back to the original and the one special fabric was all gone! I even got so organized as to put numbers on each tub and then write down on a yellow legal pad all the items in each tub. When I was looking for something, I found it much easier to check the list instead of getting out each tub and digging inside to see what it contained. It also made it easier when my quilt group had a sale and I wanted to donate something. I could look at the list – realistically decide what project(s) I would never go back and finish, and give them away to let someone else complete. I realize these tubs on the shelves look a little messy (I still have a way to go with my organization) but at least you get the idea. Now I can just pick which 4 projects are on my list for 2018 to be completed. That will free up 4 tubs for new WIPs! If you want to be really organized, you could number them in the order in which you want to complete them. It might even be helpful to set yourself some deadlines for certain projects. If you know there is a baby shower coming, or a quilt show exhibit or something that you really wanted to complete your WIP in time for, that might help you prioritize. For me it also helps to make a list and write it down. The best part with a list is crossing it off when you are done! I also keep several tubs with scrap items. One tub has 2” and 2.5” strips. One tub has 1” and 1.5” strips as well as 4 patches sewn together. I love to make scrap quilts, so these often come in handy. Don’t give up on however many WIPs you might have. You can invite a friend over to help you organize. Who knows, she might even iron for you while you work. Once you are done it will feel so refreshing to work in a clean space. Personally, I love it when (at least once a year) I clear EVERYTHING off my cutting table and start fresh.